Bhubaneswar: The Great Odisha Famine in the year 1866 was undoubtedly one of the most significant events in the country’s history and also a transforming event. It was a disaster and misfortune, said Governor SC Jamir on Monday. The failure to import sufficient rice during 1860’s, insufficient rainfall, poor food distribution network and lack of foresight on the part of British administration led to a huge amount of suffering and loss of life- the effects of which can still be felt in today’s society, said Jamir. 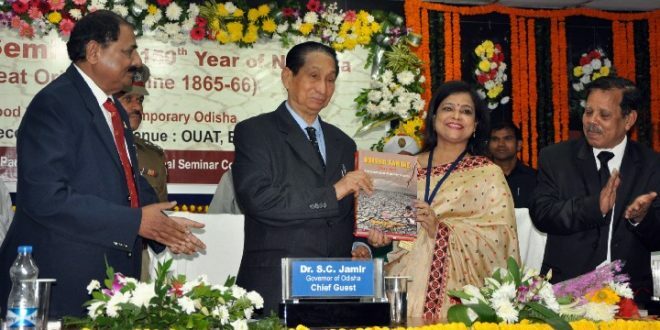 The Governor inaugurated the National Seminar on ‘150th Year of Na-Anka (Great Odisha Famine-1866) and Food Security in contemporary Odisha’, organized by Pipili Sanskrutika Parishad and National Seminar Committee on Na-Anka. Jamir said for many decades afterward the great Odisha famine of 1866 was simply a dark and even humiliating experience which the survivors and the survivors of survivors, had little wish to recall. “Addressing malnutrition and food insecurity requires co-ordinated action across a broad spectrum of actors and sectors. Recognizing this, the Government is serious to enhance food grains production and expand the sphere of food security. Indeed investing in agriculture’s development will be critical to reducing poverty,” said Governor. Commending Odisha’s commitment and leadership, Governor Jamir said that Odisha has been awarded at the national level as the best performing state for having highest production of food grains with Krishi Karman Award for last four years. He suggested to devise and accelerate the Comprehensive Framework for Action on Food Security so that it can continue to be a strong force for co-ordinated action with a range of stakeholders. Highlighting the role of agricultural universities, Governor called upon to work with partners to introduce improved varieties of paddy and other crops which would help to boost the production contributing a lot to nutrition and food security.